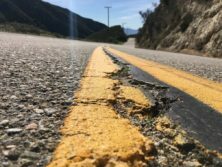 Benton Middle School seventh-grader Genesis Sandoval laid down in the middle of the cracked and empty road on the way to Mt. Baldy and snapped a photo of the lanes stretching out into the distance, believing the image encapsulated the essence of exploration and its many possibilities. Organizers of the 2017 CaliforniaStreaming Digital Photography Contest agreed, choosing Sandoval’s photo as one of its eight winners from among hundreds of entries. This year’s contest amassed 636 original photo entries from K-12 students in California, focusing on the theme of explorations. Students also wrote poems, essays or extended captions connecting the images to the contest’s theme. This is the second consecutive year, out of two years of participation, that a Benton student was named one of the contest’s winners. All nine other Benton students who entered this year’s contest were named to the contest’s honorable mention list. Benton’s honorable mentions were: seventh-graders Isabel Bautista, Moriah Contreras and Janyce Fuller; and eighth-graders Ethan Beaza, Elijah Cuevas, Amber Hernandez, Andrew Pena, Cal Richards and Jenaro Torres. Benton photography teacher Victoria Pflanzer provides multiple photography contest opportunities for her students, including the L.A. County Fair photography contest, as a means of encouraging students to exhibit their work in public. Pflanzer said she likes how the CaliforniaStreaming Digital Photography Contest combines aspects of creative writing with photography. “It’s nice to have an opportunity for the students use their academic skills and have that partner with their artistic skills to show how all of that is important to being successful,” she said. Sandoval said she plans to continue honing her photography skills through high school and has considered the idea of combining her love of writing and photography to become a photojournalist. 051917_NLMUSD_CA-STREAMING1: Benton Middle School seventh-grader Genesis Sandoval’s winning photo entry “Go the Distance” for the 2017 CaliforniaStreaming Digital Photography Contest. Sandoval was one of the eight contest winners selected out of 636 entries from K-12 California-based students. Benton Middle School seventh-grader Genesis Sandoval’s winning photo entry “Go the Distance” for the 2017 CaliforniaStreaming Digital Photography Contest. Sandoval was one of the eight contest winners selected out of 636 entries from K-12 California-based students.